Thu., May 10, 2018, 6:21 a.m.
To help get to the 2018 National Invention Convention and Entrepreneurship Expo, Jake Gendreau has set up a GoFundMe page at gofundme.com/Jake-Going-to-Nationals. Jake Gendreau heard the admonition from his orthodontist. The Northwood Middle School seventh-grader was wearing braces for the first time, and he was reminded of how important it was going to be for him to brush his teeth. In Jake, however, it sparked something much more creative. For most kids, getting this far turns the episode into a cautionary tale of extra brushing. But Jake isn’t most kids. Even as a middle school student, Jake is an accomplished inventor. He was introduced to a program called Invent Washington, which encourages youngsters to invent and design products. That invention won the statewide competition. “The next year I came up with the Backseat Baby Alarm,” he said. “I had heard stories about babies dying in the back seat of cars during the summer because their parents had forgotten them on a hot day. That invention won a second straight state title and earned Jake a trip to Washington, D.C., and the national finals. The idea of helping people brush their teeth became his next project. There are rules for projects to be entered in the Invent Washington program. For starters, inventors must document their process, journaling about their ideas, their process for developing that idea and the trials and errors that come with innovation. It’s not about throwing money at an idea, either. Long before Jake got involved with inventions, he’d been involved in a competitive league where teams built functioning robots out of Legos. That experience left Jake with a hunger to design, but it also left him with plenty of material to work with on his designs – an array of Legos and PLCs (programmable logic controllers) to allow them to perform specific tasks. The first task was to design a toothbrush handle that can be used by people with poor grip strength or with fine motor-skill difficulties. The next challenge was to find a way to help get toothpaste out of the tube and onto the brush – a task that Jake’s grandmother had complained about. That’s where the Legos and the programmable controller came in handy. Pushing a button starts a motor-driven device that squeezes a predetermined amount of toothpaste onto a toothbrush mounted underneath. As it turns out, getting the button that starts the operation perfected was more of a challenge than designing the device itself. In the spirit of true innovation, Jake designed a bigger, better button and created it with his own 3-D printer. “That was something he’s wanted for a long time, and he’d saved money toward it, so last year, on Black Friday, we got one for him,” his dad explained. Once the project was finished, complete with a 120-page journal documenting the process, Jake invited his orthodontist, Dr. David Engen, over to check out the device. 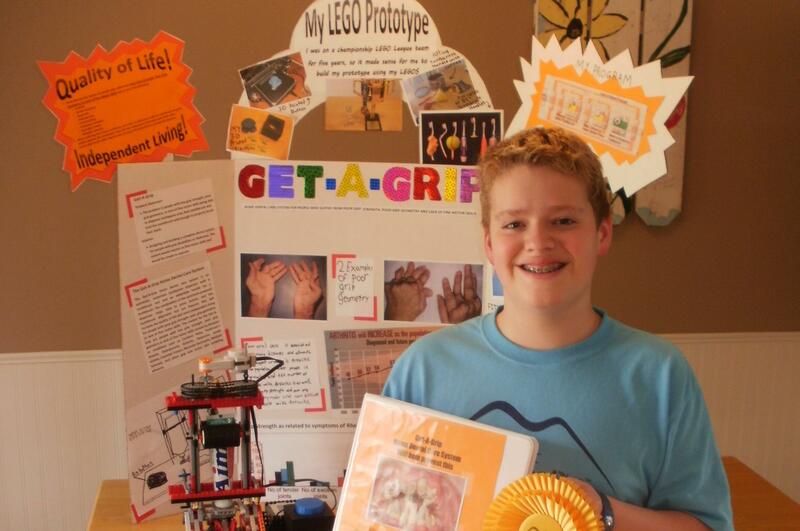 The Get-A-Grip device won the state’s Grand Champions trophy and, for the second straight year, earned Jake a trip to the national championship. “Last year the competition was in Washington, D.C., and it was a lot of fun,” Jake said. “I got to spend a whole day looking at everyone else’s inventions and seeing what they’d all done. And since it was Washington, D.C., we got to spend some time seeing the sights. We spent a whole day going through the Smithsonian Air and Space Museum. To help get to the 2018 National Invention Convention and Entrepreneurship Expo, Jake has set up a GoFundMe page. “So far, we’re about a third of the way there,” Jake said. Published: May 10, 2018, 6:21 a.m.